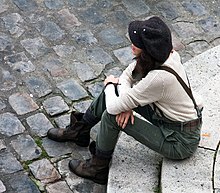 The newsboy cap or newsy cap is a casual-wear cap similar in style to the flat cap. The style was popular in Europe and North America in the late 19th and early 20th centuries among both boys and adult men. As the name suggests, it is now associated with newspaper boys. This gives rise to a misunderstanding. 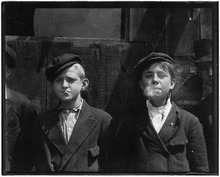 It is true that many newspaper boys and other working boys wore flat caps along with other styles. This style was not, however, worn only by boys. Flat caps were very common for North American and European men and boys of all classes during the early 20th century and were almost universal during the 1910s-20s, particularly among the working 'lower' classes. A great many photographs of the period show these caps worn not only by newsboys, but by dockworkers, high steel workers, shipwrights, costermongers, farmers, beggars, bandits, artisans, and tradesmen of many types. This is also well attested in novels and films of this period and just after. While they were worn by boys and men of all social classes, they were worn by the 'upper' classes primarily for leisure activities, and the style became associated with well-to-do country sportsmen, drivers and wealthy golfers. Although traditionally a men's cap, it has recently seen a resurgence as it has become popular with affluent women and fashion houses in the 2000s. It has also become popular among the hipster subculture. Baker boy hats are now seen in many high street retailers. For summer, many girls and women are choosing soft cotton options as the brim offers sun protection. In winter, wool blend baker boy hats are a popular option for those who want to wear a natural material. In 2011, floral cottons are the current trend following a renewed interest in home sewing. Roots Canada outfitted the Canadian Olympic team at the 1998 Winter Olympic Games in Nagano, Japan. The outfit's most popular item was the red "poorboy" cap (or poor boy cap) worn backwards. These caps became fashionable and were seen on celebrities such as Prince William and P. Diddy. 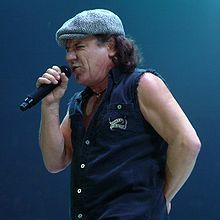 Brian Johnson of AC/DC is frequently photographed wearing this style of hat. David Beckham is frequently photographed wearing his signature Baker Boy style hat from James Lock & Co.
WWE Sami Zayn wears this style hat. ^ "Home Sewing Renaissance". Woman's Hour. BBC Radio 4, February 3, 2009. Boys' flat caps Historical Boys' Clothing website. American Newsie caps were one of many names for the flat cap. This page was last edited on 28 November 2018, at 21:38 (UTC).